This is not meant to be an all inclusive list, but we believe it does represent the major organizations available to residents in Charbonneau. If you wish to add content, have questions, or your group is not listed, but you want to list it, click here and email the specifics. Click those underlined below to go to their website. 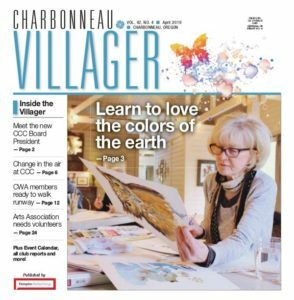 Charbonneau Arts Association is a group of volunteers dedicated to promoting and showcasing all types of hand crafted art. Each fall the well-received Charbonneau Arts Festival takes over the clubhouse for a weekend. Artists from Charbonneau, the surrounding cities and students from Wilsonville & Canby High Schools display and sell their work. Proceeds from a Saturday evening reception support the art programs at Wilsonville & Canby High School. 2O18 will be the group’s 35th festival. For more information, contact Eric Hoem at 503-694-6036. The Sunshine Service is an organization of Charbonneau volunteers, in partnership with the Wilsonville Community Center, that loans home and sickroom equipment to our residents. You may call any of the volunteers listed on page 45 in your Charbonneau Directory when you need equipment or would like to return or donate equipment. The Charbonneau Women’s Association has the longest history in Charbonneau. This active social group hosts well attended luncheons featuring interesting speakers and performances. CWA generously gifts the Charbonneau Country Club with items on our wish list, a defibrillator for the clubhouse, a water feature for the entry and a stone bench for our new Garden Terrace, among other gifts. If you’re new to Charbonneau, new to golf – either or both – or you just do not have time for an 18-hole round, you may want to consider the Charbonneau Ladies’ Nine-Hole Golf Association. Also referred to as the “Niners”, we play nine holes of golf as a group every Tuesday morning from the first week in April through the last week of October. The “Niners” have their own very popular dance team and social memberships to the “Niners” are available. CWGA members play 18 holes of golf as a group every Thursday morning from April through October. The first Thursday of the month is a shotgun scramble followed by a lunch in the club house. Special events, tournaments and social gatherings are held during the season. The Charbonneau Men’s Club welcomes members from Charbonneau and the surrounding communities. From April through October club members enjoy Wednesday and Saturday golf tournaments and social events. The Men’s Club includes both 18 hole and 9 hole groups. The highlight of the season is The Men’s Invitational Tournament held in August. Boys and Girls Aid Society was founded in 1885 and has a stated purpose of improving the condition of the homeless, neglected and abused children of the State of Oregon. The Cypress Auxiliary in Charbonneau has a membership of approximately 70 whose main focus is on raising funds for the many programs; however, recently they are having some hands-on activities such as preparing and serving dinner and having craft sessions at a home for teenage girls’ . The main fundraiser is a crab and rib dinner in March. The auxiliary meets most months for lunch on the third Friday at Spring Ridge.